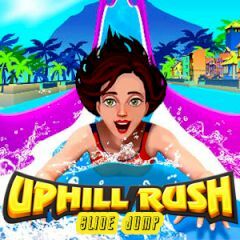 Rush this amazing water slide and set new high scores in the game. The only thing you need to do here is press buttons to accelerate. When you achieve high speed the boat takes off and flies towards water pool. Collect diamonds, bonuses and other stuff in the air and when you land. Unlock new skins and have fun.